Four Sons is the greatest F.W. Murnau film shot by someone other than Murnau. While this may seem like a facetious remark, most critics have associated this hugely popular hit of 1928 (it was Fox’s most successful film that year after Frank Borzage’s Seventh Heaven) with the tremendous artistic influence wielded by the German expressionist master on the Fox lot in the mid to late 1920s. While Murnau’s own career at Fox ended in tears, with a couple of compromised films after Sunrise (1927), the powerful appeal of his expressionist visual style and advanced, fluid camerawork inspired Fox’s other contract directors – like Ford – to stretch their wings. It is great fun watching Four Sons with a view to spotting the overlaying of visual and technical aspects of avant-garde modernist “European” cinema on Ford’s distinctive thematic preoccupations. It is often said, by such critics and biographers as Andrew Sarris and Joseph McBride, that John Ford only really became “John Ford” in the late 1930s. Yet there is no doubt that we are watching a “John Ford” film when viewing Four Sons. 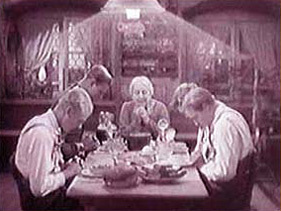 Still, the very first shot of the American release version (which had a synchronised soundtrack, in contrast to the silent European version, a copy of which was found quite recently in a Portuguese archive and restored by the U.S. Academy of Motion Picture Arts and Sciences) looks at first glance like an outtake from Murnau’s Der Letze Mann (The Last Laugh). Ford has decked out the village postman (played by Albert Gran) in a resplendent uniform and a luxuriant set of walrus whiskers and shot him in medium close-up – with a kind of comical intent – in almost exactly the same fashion as Murnau presented Emil Jannings’ hotel doorman at the outset of his 1924 masterpiece. Ford’s camera then tracks this eminent figure (eventually reduced to a hunched over and defeated man, emulating the degeneration of Jannings’ character) through a mythically kitsch “Bavarian” village set. The seemingly effortless complexity of all the extended tracking shots in Four Sons was inspired by Murnau’s innovative use of the mobile camera. Indeed, Ford had spent two months in Europe in 1927, as McBride recounts (1). This junket, financed by Fox to shoot location footage for Four Sons, took the director to Berlin, where he met up with Murnau, recently returned from Hollywood after shooting Sunrise. McBride writes that Ford immersed himself in German filmmaking techniques and Murnau showed his American colleague his pre-production designs and shooting methods. When shooting Four Sons in the autumn of 1927, Ford decided to apply what he had absorbed in Berlin to a script whose German and American urban settings lent themselves to Murnau’s tour-de-force style, compellingly on display in Sunrise. Murnau’s city sets were re-used for the New York sequences in Four Sons, but more than that, Joseph Bernle’s arrival in the city replicates that of the Man and Wife in the earlier film – including shots of static figures surrounded and momentarily masked from view by careening automobiles. The architectural details of the Bernle family’s village are also highly reminiscent of the bourgeois town in Murnau’s Nosferatu (1922), as are the static, sentimental interior domestic tableaux which served as a relief from all the Gothic horror in the vampire classic. The most overtly expressionistic shot in Four Sons shows the postman’s shadow delivering the black-bordered envelope announcing the battlefield deaths of two of the family’s sons, Johann and Andre; Murnau perfected the use of the portentous shadow in Nosferatu. Finally, the tracking shots across the misty fields of battle duplicate those across the marshes in Sunrise – mapping, in both Murnau’s and Ford’s films, the mysterious space of personal crisis and a personal encounter with death or destruction. But that other great Old World innovator, Sergei Eisenstein, also makes his presence felt in Ford’s experimentation with montage to convey profound political meaning. Consider, for example, the two vastly contrasting emotional close-ups of the bespectacled young man separated by six quick shots of Major Von Stomm (Earle Fox) hacking a black cat to death with his sabre; or the track in to the mouth of a trumpet followed by a quick dissolve into the horror-stricken open mouth of Frau Bernle (Margaret Mann). In both sequences, highly reminiscent of the use of close-ups in Strike (1924) and The Battleship Potemkin (1925), Ford is able to telegraph, through the unpredictable juxtaposition of brief shots, a powerful critique of militarism as a means by which the ruling classes control and traumatise the people. Thematically, Ford’s Four Sons recalls many later films in his long career: the ambivalent pacifism of Pilgrimage (1933) and The Long Gray Line (1955); the didactic approach to education as a necessary qualification for American citizenship in The Man Who Shot Liberty Valance (1962); the use of communal dance to indicate social unity in My Darling Clementine (1946) and Fort Apache (1948); the sentimental, yearning reverence for the maternal and the domestic in The Grapes of Wrath (1940) and The Searchers (1956); the pious religiosity of The Informer (1935) and The Fugitive (1947); the nostalgia for the pastoral in The Quiet Man (1952) and Cheyenne Autumn (1964); the quirkily comic potential of “the folk” in Judge Priest (1934) and She Wore a Yellow Ribbon (1949); and the nationalist reverence for an immigrant’s idealised America which suffuses almost all of Ford’s work, irrespective of genre. All of these familiar themes – either endearing or repugnant, according to one’s taste for Ford – are present in Four Sons. Much more complex than a mere imitation of more critically well-regarded European “masters”, Ford’s film is a strikingly beautiful hybrid of form and content that ultimately ranks as one of the director’s most significant early works, one attesting to the productive internationalisation of the film industry in the 1920s and the coming of age of a star director. Joseph McBride, Searching for John Ford (St. Martin’s Press, New York, 2003), p. 160.